I wish I had a long and interesting story about the acquisition of this solitary can of 21st Amendment’s Lower De Boom Barleywine, but the truth is that there isn’t one. This solitary can of beer was courtesy of our good friend The Alemonger. He brought it over during our Branca Menta research session. Lower De Boom is a powerfully balanced American-Style barleywine packed with citrusy Pacific Northwest hops. Chestnut brown in the glass with notes of toffee malt, fruitcake, toast, piney hops and more than a hint of alcohol. Our liquid gold is the first American craft beer in a can offered in the traditional barleywine “nip” size. Perfect to enjoy sipped at the end of a long day. More than that and you might feel like the boom has been lowered on you. Appearance: Clear, auburn color. Minimal head that dissipates rapidly. Zero lacing. Aroma: Lots of sweet aromas coming off this one. I’m getting candied orange peel, dried figs, honey, and a hint of citrusy hops. Taste: Lightly carbonated with a surprisingly light mouthfeel. Starts off with a much bigger hop presence than I was expecting, though it was far from overbearing. At mid-palate the rich, fruity malt flavors take over, with lots of those dried fig and honey notes coming through. Finishes with a nicely balanced and bittersweet medley of flavors. There’s also a big alcohol punch to remind you to take it slow with this one. I haven’t had many Barleywine style beers, so I’m lacking a point of reference this time around. I’ve had the Sierra Nevada Bigfoot before, and I remember enjoying it, but trying just one Barleywine does not make me a Barleywine expert. 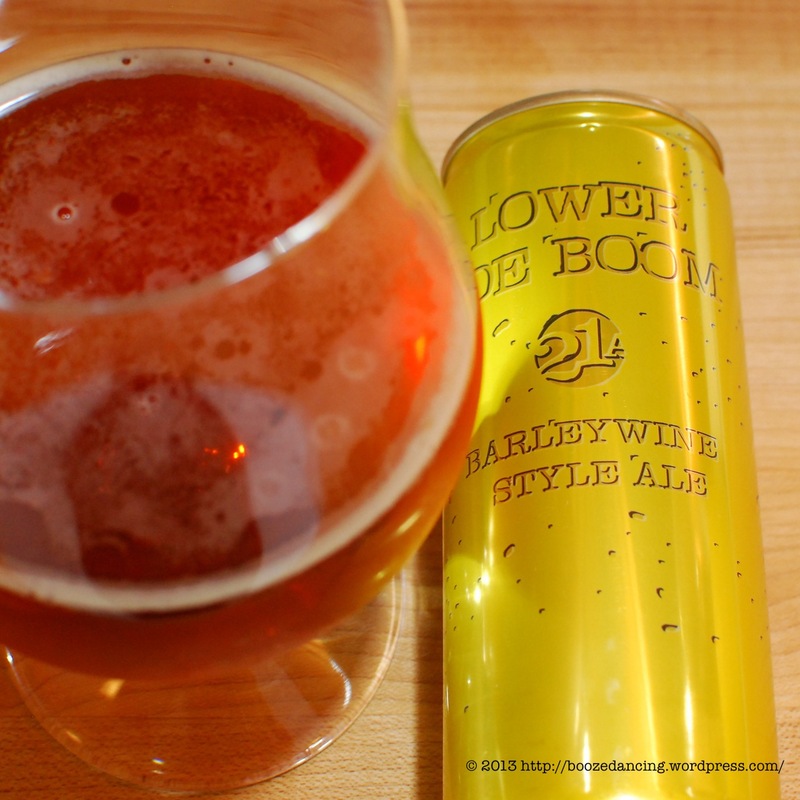 That being said, I definitely enjoyed the Lower De Boom (love the “nip” sized can too! ), but I doubt that I will be having it again anytime soon. I like how the sweet and lightly bitter elements come together, but it’s far too boozy for me to enjoy on a regular basis. I’m thinking this would be a fine beer to have in lieu of dessert, or even to have on its own on a cold winter night. Since today’s high was close to 88, this probably wasn’t the best choice of beer given the somewhat balmy conditions in South Jersey. Philly Beer Week News: PhillyTapFinder Helps You Navigate All The #PBW2013 Events! I’ve (gasp!) never had Bigfoot, but I really liked Lower De Boom’s use of hops. A solid “West Coast” version of this beer for sure. Don’t feel too bad about not having Bigfoot. I mean, I’ve only had it once. Good stuff for sure, but not something I would go out of my way for. I’ve had a few of 21st Amendment’s beers, and I always find that when they embrace the Northwest hops, their beers are just better, like Back in Black, but when they don’t, like Fireside Chat, they become unimpressive. I haven’t had many barleywines, but I’ve heard that Bigfoot is the best widely-distributed one out there. I plan to keep my eyes open for this one, though. Thanks. I think we’re on the same page with 21st Amendment. So far, Fireside Chat is the beer of theirs that I didn’t care for. And Sneak Attack was just ok. Other than that, they’re a solid brewer. G-LO, just thought you should know. I attended my first Brewers Guild meeting in my city. I didn’t make anything, but I got to drink a lot. Black IPA’s are taking over. Not a bad thing, just a mental note. It was awesome. Ohhh! Sounds like great fun. Wookey Jack and Back in Black Black IPA per chance? Those two are ridiculously good!